In our map above, countries depicted in the darkest blues have far fewer men than women – and the former Soviet Union stands out from the rest of the world. This region has been predominantly female since at least World War II, when many Soviet men died in battle or left the country to fight. In 1950, there were just 76.6 men per 100 women in the territory that is now Russia. That number rose steadily in subsequent decades, climbing to 88.4 by 1995 before declining again. The gender ratio in Russia is currently 86.8 men per 100 women, and the ratios in Latvia (84.8), Ukraine (86.3), Armenia (86.5), Belarus (86.8) and other former Soviet nations are similarly low. So what are the factors that set the former Soviet bloc apart? The population in Russia and the former USSR as a whole is older than that of the world. Most of these nations, including the most populous, also have low fertility rates compared with the global average. 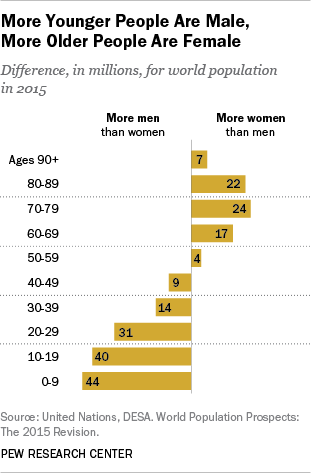 This skews the population’s gender ratio because older people are more likely to be female, while more younger people are male. Research over hundreds of years shows that boys naturally outnumber girls at birth. Historically, there have been about 105 boys born for every 100 girls, and this leads to more males than females in younger age groups. At the same time, women have lower premature mortality rates than men and tend to live longer, leading to a higher number of older females than older males. We created an alternative list of age-standardized gender ratios (.xlsx) for each country (though we didn’t use it in the analysis for this post) by weighting the gender ratios so that each country has an age distribution more closely aligned with the world’s age distribution overall. After the adjustments, former USSR nations disappeared from the list of top 15 countries that have the fewest number of men per women. That’s because the Soviet bloc is older than much of the world, skewing its population more female. Younger men in the former Soviet Union also have an unusually high mortality rate, which has widened the population’s gender imbalance. One way to see this is to look at the life expectancy of men and women and the differences between those numbers. Russian women born from 2010 to 2015 are expected to live to age 75.6, while Russian men are expected to live to age 64.2, a gap of 11.4 years. Other former USSR countries, such as Belarus, Ukraine and Latvia, have similarly high gaps, with many men in this area losing their lives to alcohol-related incidents, suicides and diseases, among other causes (as noted by demographer Murray Feshbach). The only nation with a higher life-expectancy gap between genders is war-torn Syria. Alcoholism has long been a problem in the former USSR, especially for young men. A 2014 study in The Lancet medical journal found evidence that excess vodka use is a top killer in Russia, responsible for a disproportionate amount of deaths among Russian men. And a 2013 Pew Research Center survey found a stark gender divide on attitudes toward drinking in Russian society: 52% of women believe that drinking alcohol is morally unacceptable, compared with just 36% of men who say the same.